Sounds like football. . . 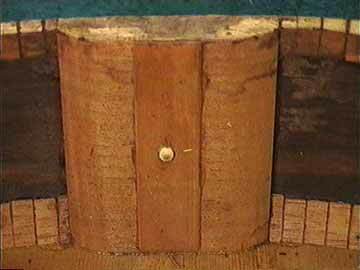 The end block is a big chunk of wood inside the bottom end of an instrument that reinforces the joint where the sides meet. The back has been removed during a big repair operation, and you can clearly see the size and thickness of the end block. There's a narrow reinforcement strip over the block to prevent cracking in case the guitar is dropped on its end. Sticking through the block, you can see the inside end of the end pin, which fits in a tapered hole through the end block. Instruments could be made without end blocks, but this area is so vulnerable to damage, it wouldn't be a good idea!